I’m talking about Florida and the Big Cypress Swamp. To be more specific the address is: Harley-Davidson, 5301 34th Ave. 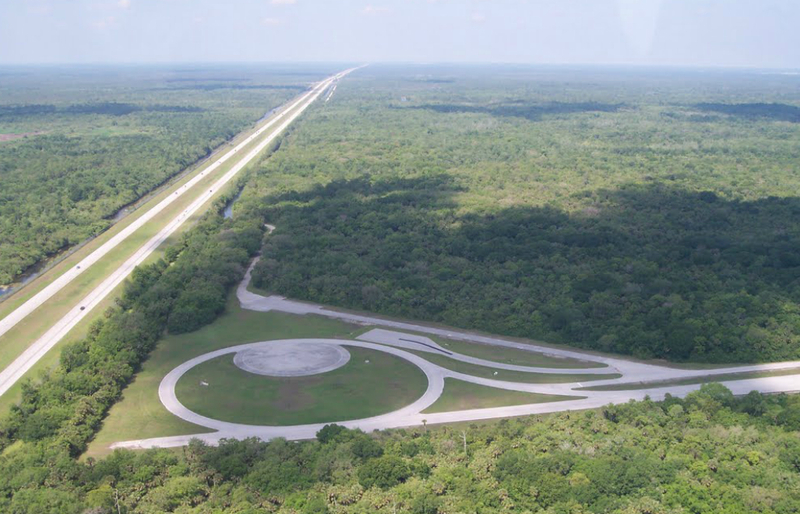 S.E., Naples, FL., a 531-acre private test track north of Interstate 75/Alligator Alley. The facility has a 2.1-mile straight away and a 1.1-mile ride-and-handling loop. Prior to 2002, the test track was owned and used by Ford Motor Company. In October 2009, Harley-Davidson announced plans to consolidate its test operations in Florida and Talladega, AL. sites to the Arizona Proving Grounds in Yucca, AZ. There were approximately 8 employees and as many contract employees at the Florida facility at the time. 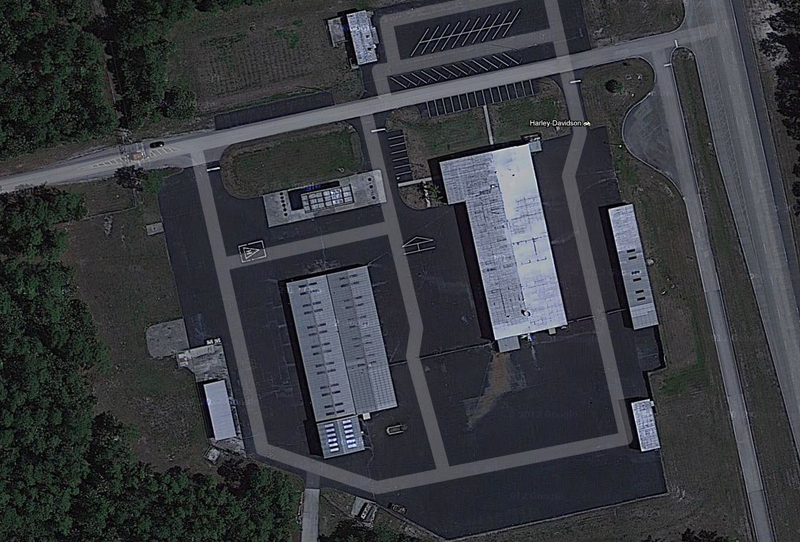 Earlier this month, the automaker Chrysler Group LLC announced they purchased the property for $7 million with plans to use the more than six miles of tracks to test a wide range of pre-production vehicles. Harley-Davidson Motor Co., agreed to lease back a portion of the track to test motorcycles and other specialty vehicles along with 10,200 square feet within two buildings on the property. That lease will last through at least June 30, 2019. Construction of the track and its associated buildings began in 1985 and ended in 1992. In 1998 the test track was the subject of a lot of scrutiny when nearby property owners and environmentalist became concerned about expansion that would harm the neighborhood. Photos courtesy of Google and Collier International. During WWII the U.S. Army established numerous airfields in Arizona for training pilots and aircrews of the USAAF fighters and bombers. Just east of I-40 and about 25 miles south of Kingman, AZ is the Yucca Army Airfield. In 1946 the property was declared surplus and in 1954 the Ford Motor Company acquired the facility and began using the runways for automobile testing. 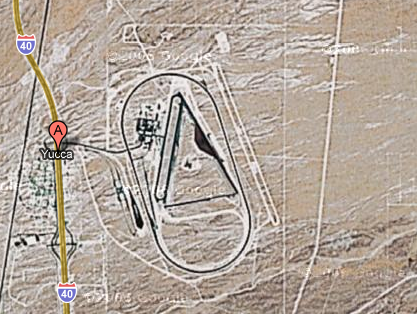 Ford eventually built an extensive automotive proving ground and used the airfield known as the Arizona Proving Ground Airport. In November 2007, Chrysler bought the facility (3,840-acre test site, which has 50 miles of test roads) for $34.9M from Ford Motor Company. Chrysler also made another $10M in upgrades, including a new 70-foot-high test grade along with other new test surfaces. The facility is open 24/7 and the Yucca site is the primary hot weather testing grounds. Chrysler tests about 2,000 vehicles a year at the site. As a side bar, Toyota’s desert proving grounds is 128 miles away in Wickenburg, AZ and runway information is HERE. Harley-Davidson recently closed an agreement with Chrysler to use the facility effective July 2009 as their desert proving grounds. Harley will occupy several buildings and use the banked, high speed, five-mile, three-lane oval track as well as many of the twisted asphalt and checkerboard tile concrete roads. I don’t know about you, but I can see a day in the future where the Laughlin River Run in coordination with the Route 66 Motor Sports and “Mother Road” Harley dealer in Kingman might include facility tours and/or sport track demo rides. Let’s hope so!